Meanwhile, cities that only allow medical marijuana use saw the same growth as cities where all marijuana use remains illegal. While marijuana is illegal on a federal level, many states have taken steps to legalize the drug since 2012. Currently, marijuana is legal in Colorado, Washington, Oregon, California, Nevada, Alaska, Michigan, Vermont, Massachusetts, Maine and the District of Columbia. Fourteen other states have decriminalized marijuana, which means that possessing small amounts is treated like a civil violation. Courtesy of Clover Real Estate. Ever since states began legalizing recreational marijuana in 2012, homeowners have expressed concern that the drug’s increased use would lead to higher crime rates and lower property values. According to Clover’s findings, however, the reverse appears to be happening — many homebuyers, particularly younger ones, are seeking out homes in states where marijuana is now legal. 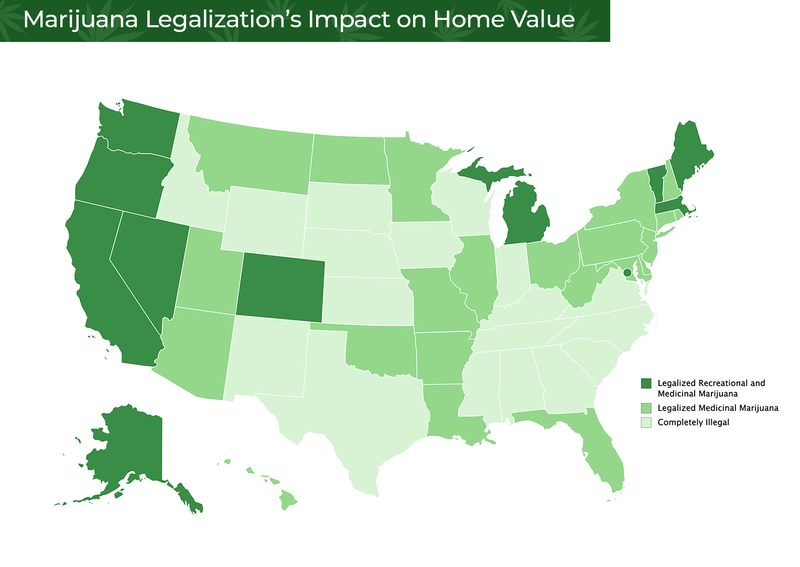 “States that legalize recreational cannabis see an immediate bump in home values following legalization, even without retail dispensaries opening up,” the study reads. Colorado and Washington, which were the first two states to legalize recreational marijuana use in 2012, experienced the highest increases in home values in the past several years, according to the study. Of course, many factors contribute to the rising home values in these states. Most of the West Coast has been experiencing a major property value boom since 2012. The sharpest growth can be seen in San Diego, where the average home value has grown by $303,200 since 2016. But while some states that legalized marijuana saw an uptick in violent crimes over the past few years, those numbers did not have the anticipated averse effect on property values. “The data suggests real estate investors can find blazing housing markets in cities where recreational cannabis is legalized,” reads the study. Article image credited to Opra/Shutterstock.com.